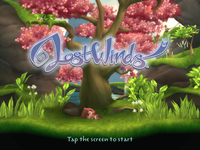 LostWinds is a platform/adventure video game developed by Frontier Developments for WiiWare. The game was released in North America on May 12, 2008 and in Europe on May 20, 2008, serving as a launch title for WiiWare in both regions. The game revolves around a young boy named Toku tasked with saving his homeland from the vengeful elemental Balasar with guidance from the wind elemental Enril. The player controls Toku, but simultaneously uses the Wii Remote to draw directional paths on-screen that control the wind. Wind is used to enhance Toku's jumps, defeat or immobilize enemies, and solve puzzles. A second player can also join in with their Wii Remote controlling a second on-screen wind cursor, allowing Toku to fly farther but not higher. Source: Wikipedia, "Lost Winds," available under the CC-BY-SA License.